The open letter published by The Telegraph is seen as something of a show of strength by the Brexiteer wing of the Tory Party, which is currently attempting to thwart Remain-voting Prime Minister Theresa May’s Chequers plan to keep the United Kingdom subject to large swathes of the EU’s rules and regulations, and possibly leave the entire country in the bloc’s Customs Union as a so-called ‘backstop’ solution to keeping the border between Northern Ireland and the Republic of Ireland free of customs infrastructure. 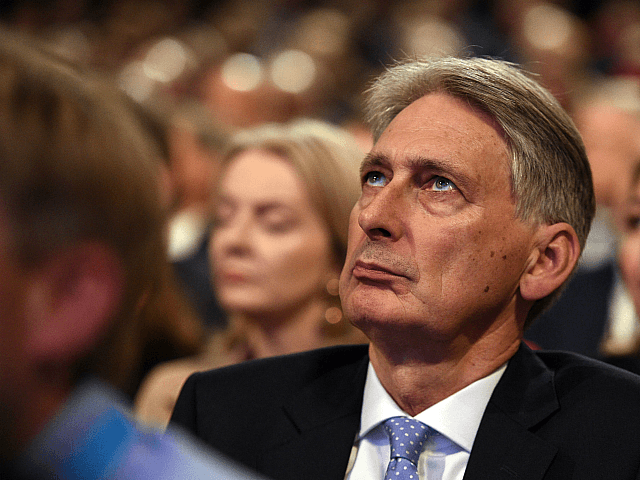 Specifically, the letter signed by 63 Tory MPs takes aim at Treasury chief Philip ‘Remainer Phil’ Hammond’s leaked economic forecasts claiming a ‘No Deal’ Brexit would deliver a 7.7 percent hit to GDP over a period of years, hinting that they are — like the Treasury’s pre-referendum anti-Brexit forecasts turned out to be — based on flawed or manipulated modelling. “It is unacceptable that the Government leaks the results of its modelling when it suits but simultaneously hides what lies behind these forecasts from the public,” the letter begins, alluding to the fact that the Treasury has not made it clear how it has arrived at its highly negative predictions. “The Cross-Whitehall Brexit Analysis leaked to the news website Buzzfeed early this year and subsequently ‘published’ in the form of 24 PowerPoint slides, forecasts a 7.7 percent hit to GDP under a World Trade Deal under WTO rules and a 4.8 percent contraction under Canada Plus… independent private sector forecasts and those of Whitehall are wildly far apart, many of which forecast a positive impact on GDP,” the signatories point out. They suggest that Hammond’s own words suggest the disparities are based on difference in calculating “the benefits accruing from [new] free trade agreements and the impact of any possible new non-tariff barriers [between Britain and the EU”. They then go on to say that the Treasury’s analysis appears to be predicated on the EU behaving “illegally and in defiance of WTO rules that are backed by the international legal order”, and express concern that the department is indulging in “policy-based evidence-making” — i.e. shaping their research to support a desired political outcome, rather than providing legitimate research. Hammond is widely seen as being the major force behind efforts to either thwart Brexit or ensure that it is delivered ‘in name only’, with the country remaining subject to most EU obligations and regaining only very limited powers over its regulatory regime, trade policy, fishing waters, and so on. At least one Cabinet colleague has gone so far as to say the Chancellor is trying to “frustrate” and “f*ck up” Brexit on purpose.